Wifredo Lam was born on December 8th, 1902, in Sagua la Grande – a sugar producing region on the northern coast of Cuba – the year the country proclaimed itself a Republic, after a little more than three centuries of Spanish rule. The youngest of eight children, he was baptized Wilfredo Oscar de la Concepción Lam y Castilla (1). His mother Ana Serafina Castilla was born in 1862 in Sancti Spiritus of mixed Spanish and African heritage. On her African side, she came from a long line of slaves. His father Enrique Lam-Yam was Cantonese, born in China in 1820. He is thought to have left China to work in California and then in Central America before reaching Cuba sometime between 1872 and 1880. 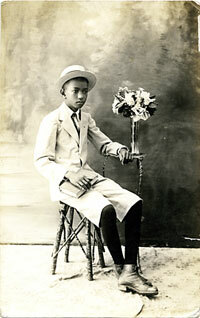 He may, however, have immigrated directly to Cuba with his brother Ciu in 1860, fleeing the Taiping Rebellion. In the small town of Sagua, Lam-Yam opened a carpentry business. As he spoke several Chinese dialects, was well educated and versed in calligraphy, he also served the local Chinese community as a public scribe. Lam grew up in a modest but relatively open-minded family at a time when blacks and mulattoes still suffered discrimination. He spent his childhood in the midst of a “sea of sugar cane” and fertile fields bordered by royal palms, stretching all the way to the horizon. The island has some of the world’s richest faun and as Lam once said, “When I was very little, I was surrounded by my own little jungle.” This atmosphere of luxuriant, brightly colored nature undoubtedly caught his attention very early on. Enrolled in a public school in the neighborhood of Cocosolo, he was above all steeped in a melting-pot of civilizations: the Catholic religion of the island and the faith his mother had adopted; the cult of his Chinese ancestors, practiced by his father in the form of offerings; Cuba's African traditions, especially black magic as practiced by his godmother, Antonica Wilson. His godmother, “Ma'Antonica” as her godson called her, which is often written “Mantonica,” was a well-respected priestess of Santería. She exposed the young Wilfredo to the rudiments of the religion and its symbolism and often recounted captivating stories as Santería possesses a rich mythical corpus that abounds with the adventures of its anthropomorphic deities. And while his father – a wise and very secretive man who supported the democratic leader Sun Yatsen and his reformation party – would sometimes recount the dramatic episodes of Asian history, set in the enormous expanses of the Siberian landscape, of Mongolians and Tartars, it was his mother’s stories that had the greatest impact on his imagination. He especially enjoyed hearing about the adventures of José Castilla, a converted and freed man of mixed-race who had his hand cut off by a Spanish crook, and hence his ancestor’s nickname “Mano Cortada” (cut hand). Antonica Wilson, meanwhile, was hopeful her godson would follow in her footsteps and inherit her secrets to become a babalao, a Yoruban word meaning “father of the secret” (divine interpreter of oracles and signs). But the young Wilfredo refused even the initiation stage. All the same, she put him under the protection of the gods, in the care of Chango, the god of thunder, and Yemeya, the goddess of the sea. By the age of seven he was already showing signs of an artistic calling, but Sagua lagged behind in cultural development. He may have been shown the mediocre religious paintings that adorn its churches or accompanied his father to the traditional Chinese theater and new-year celebrations. But he did observe the calligraphy of his father and the many avatars of African sculptures in his godmother's house – artifacts which were forbidden during slavery. He thus simultaneously discovered very different iconographic worlds. He loved to draw (landscapes and portraits) and took a great interest in art books with their black and white illustrations, poring over the masterpieces of Da Vinci, Velázquez and Goya, but also of Gauguin and Delacroix. They were a window to Europe, the prompts that made him vow to one day see the originals at the Louvre and the Prado with his own eyes. Wifredo was sent to Havana in 1916, his first encounter of a large, bustling city. It appeared to him as a city bathed in its own particular light, both dense and airy. The family had hoped the young Wilfredo would go into Law, but he was clearly already on the path to becoming an artist. He visited the city's Fine Arts museum, created in 1913, discovering its somewhat provincial Spanish and Hispanic Cuban artists and its Greek, Egyptian and Roman artifacts. He went for strolls in its botanical gardens – built a century earlier – and liked to sketch its tropical plants. He was fascinated by the lush leaves and swollen fruits and the striking colors of their flowers. He also scoured the city’s bookshops in search of the latest publications. 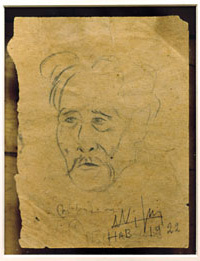 In June, 1920, Lam became a member of the Association of Painters and Sculptors of Havana. Three years later, he exhibited his first paintings at the Fine Arts Salon of Havana, following which he was invited to present his work in his home town of Sagua La Grande. The two events brought him a degree of success, prompting Sagua to award him a grant to pursue his studies in Europe. The director of the Museo Nacional de la Habana, Antonio Rodriquez Morey, provided him with a letter of recommendation, which would give him access to Madrid's high society. (1) He lost the “l” to his name following an administrative error in the mid-twenties, from which point the painter adopted the new name, signing his works with the new spelling.